Everyone asks what I would plan for my own wedding and to be honest I have no clue. I feel like, in so many ways each event I design has a little bit of me in it. It is designed for my client and with their tastes and desires first and foremost, but each time I get to play with their favorites, it’s like they are my current favorites. Sometimes I am dreaming in Wedgwood blue and other times I am thinking bohemian. Some days I am super into the color green- jade, palm frond, grass, moss and other days I can’t get enough amethyst. 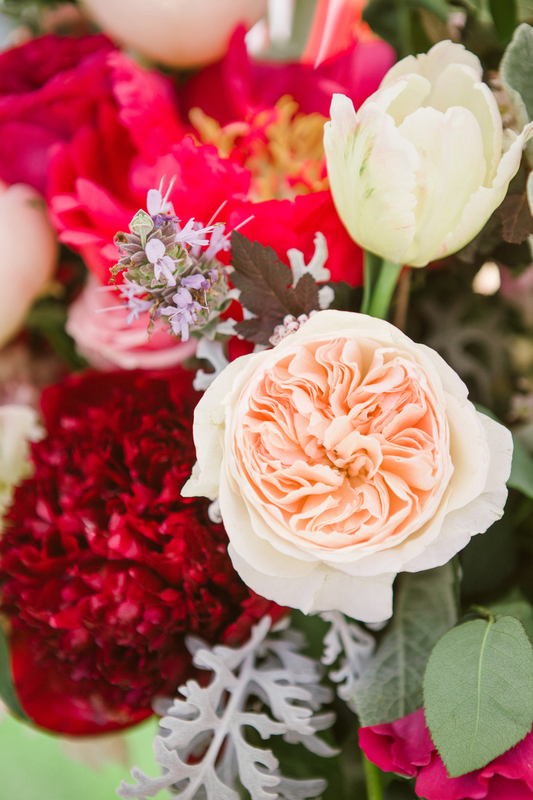 So when my dear friend and floral designer Tenley Erin Young got engaged to Parker during a late afternoon sail in Maine, I couldn’t wait to see what she would pick for her florals and color palette. Turns out it wasn’t so easy to narrow it down. Tenley and Parker ended up deciding on gold, silver, copper, teal, peach and glitz. It was a little boho and a lot of glam. 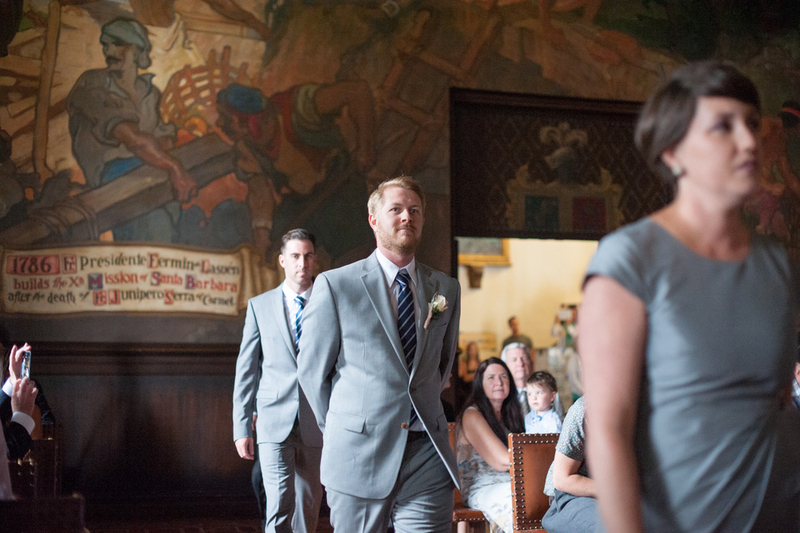 The wedding ceremony took place in Santa Barbara’s Courthouse Mural Room. It was the perfect backdrop for them to say their I do’s. Tenley walked down the aisle in a Maggie Sottero gown, carrying a bouquet of deep red peonies, garden roses, lambs ear and touches of lavender. Her bridesmaids wore gowns they picked on their own but all that complimented each other from Adrianna Papell, Jenny Yoo, and Xscape. Tenley gifted each lady a fur to stay warm on the foggy Santa Barbara morning. 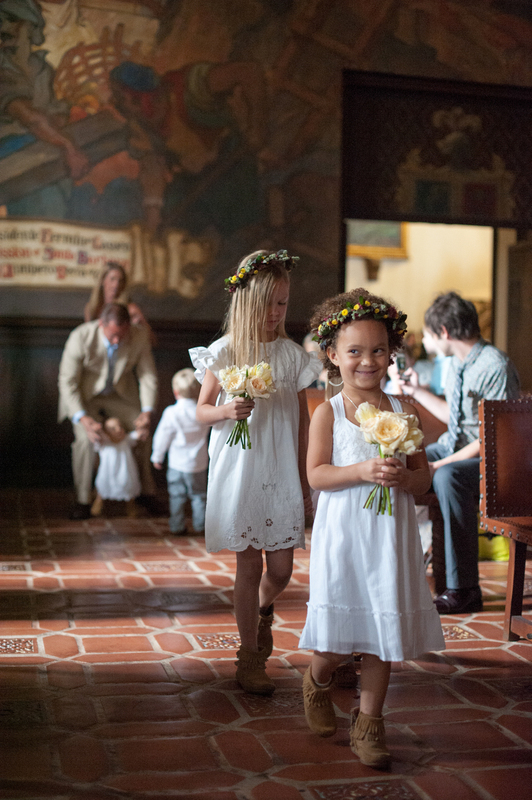 After the ceremony all the guests took group photos in the sunken gardens and then Tenley, Parker and Jillian Rose their amazing photographer departed to capture private moments all along the way to the Santa Ynez Valley. The reception was held in the backyard of Tenley and Parker’s new home. They wanted it to feel like a big, fun, bash! They incorporated all of their favorite foods in stations that were constantly refreshed for guests, they had a bubbly bar with all the fixings and mixings and when it came time to eat dessert an assortment of cakes from Sweet Splis that would put any bakery display to shame and a candy bar, because Tenley loves sweets. Everyone danced late into the night to Danny of Elite Disc Jockeys mixes. It was perfectly Tenley and Parker… and when it was time for them to leave, we lit sparklers and surrounded them for one last hurrah before they departed.